We have been through one of the wettest summers on record, and the effect on wildlife has been interesting. Most native plants have flourished quite well, the cool weather leading to a long flowering period for many of them. Elder is typical. The flowers came early in one of the rare warm spells at the end of May, then went very slowly through their normal flowering period of June, with a further flourishing in the warm weather at the end of July. Now the berries are there, hanging in black bunches. Blackberries flowered really late, and in some cases too late for the berries to set and ripen properly. Those that did manage to ripen have come very late, and will still be pickable at the beginning of October. However, like all fruit this year, they lack sweetness because of the lack of sun. Fruit in general will be in short supply this year. The plums, apples and damsons in my garden have yielded hardly anything, though some local trees seem to have had a reasonable crop. It’s the same in the wild. Some crab apples are bare, and cherry plums were too. Hawthorn berries look good, as they flowered later. Blackthorns are bearing sloes, though not thickly. The problems were firstly due to lack of pollination because the insects weren’t there in the cold spring. Some blossom caught a late frost. Any fruit that did manage to set was then decimated by even later frosts then cold heavy rain and hail. This year should finally lay to rest that old myth about lots of berries meaning it’s going to be a hard winter, since it’s so obviously due to the spring and summer weather. We often don’t notice the shortage of bees, butterflies and other insects, because they’re there on the nice sunny days when we go out. But they don’t like cold and rain, so there were many days when they were just not around doing their pollinating. Of course, this hit farms and gardens too. Broad beans were a notable casualty, often having only a few beans setting in each pod, and tomatoes set and ripened thinly and late. Lack of insects and berries has taken its toll on birds, along with the very cold spring which killed off many young birds born in the “false spring” in March. I noticed this especially with the mallard ducks, which carried on having young into late August, perhaps to compensate for the early broods which didn’t survive. However, we have a fine family of swans here in Withybed, with all six cygnets surviving. They are full size but still in their soft fawn plumage and beaks. I don’t know where the idea of the “ugly ducking” came from, as I think young swans are very beautiful. One kind of wildlife that will probably do well this autumn is fungi. Last year I went out looking for them and they were quite rare, because everywhere was so dry. I don’t think that will be a problem this year, though the warm dry start to September slowed them down. They had come unusually early. In July I found some field mushrooms, which don’t normally come till autumn. I found boletus ripe in a conifer wood in August. The last two autumns I have been on “fungus forays”, and seen a lot of interesting kinds with people who know what they are, though I can’t always remember them! I recommend this way of getting to know them. Fungi are of course everywhere, but many are too tiny to see. The soil has microscopic fungi, and plants depend on them to grow well. It is a system where both feed off each other, and individual fungi usually have special plants they exist with. It’s one of the reasons why natural systems of farming and gardening are more sustainable than intensive and artificial methods, where the microscopic fungi are often lost. The kind we recognise, mushrooms and toadstools, are the fruiting bodies of big organisms that spread underground, or through wood or other vegetable matter. So if you pick a mushroom, you don’t damage the main part of the fungus. It is probable that huge underground fungi systems are the biggest living organisms, and there are more than a million different kinds. We depend on them as the basis for all growth of plants and animals. Some fungi are destructive of trees, finding their weaknesses. Honey fungus will spread through a tree, and by the time you see the fruiting bodies around the base it is usually too late. However, leaving some dead wood around is a good way to attract wood-growing fungi as well as other wildlife. Fungi on trees that you might recognise are the porcelain fungus, which grows on beech and is dead-white and translucent like china, and the common many-zoned polypore bracket fungus, also known as turkey-tail because that’s what it looks like! The crampball fungus is also known as King Alfred’s cakes, and looks black and burnt. Fungi are not flowering plants, so do not have seeds. Instead, they have spores which form under the fruiting body, and these help them spread. They tend to come up again and again in the same places, so once you’ve found a spot it’s worth going back. Most of the fruiting bodies only last a day or so. They come up from the ground or tree in the fleshy form we are familiar with. Most of them have gills underneath, though some have a spongy texture. Here the spores form, and as they get older the body of the fungus blackens and becomes slimy. They are most common in early autumn, especially in a wet warm spell. Some, however, grow at other times of year. One you can find in unimproved fields and open hillsides is the St George’s mushroom. This comes (around St George’s Day) at the end of April or beginning of May. It looks a bit like the familiar field mushroom, white on top with paler pinkish-brown gills. It sometimes grows in “fairy ring” patterns. It is the only fungus of this type at that time of year, so is fairly safe to eat. However, never eat fungi if you are not sure what they are. Some of the poisonous ones are very similar to some of the edible ones, and there are deadly ones in England. It’s best to just get to know them for their own sakes first! Experts can show you what to look for. This includes where they are growing, the colour and texture of the cap, gills and stem, whether they change colour if cut, and what they smell like. This is why a picture doesn’t always help. Some fungi are very recognisable. One is found on elder trees, which you can identify by their blossoms and fruit if you don’t know the leaves. It is usually called “jelly ear” these days, though it used to be called Jew’s ear. In fact, it was originally Judas’ ear, so named because legend had it that Judas was hanged on an elder tree. It looks like its modern name, a jelly-like ear on the bark of the tree. It is edible and tastes good. There are other fungi with helpful names. One is the cauliflower fungus, which looks like its name. It grows at the edges of coniferous woods, and I once found one at Newbourne Wood. It is edible but hard to get clean because it is so lumpy! Another is the hedgehog mushroom. This looks like any other mushroom-type fungus on top, but when you turn it over it has spines hanging down. I have found these in woods elsewhere but not yet round here. This too is edible. A very common one that you might find in your garden or see on roadsides is the shaggy ink-cap, also known as the lawyer’s wig. Both names help. It is a tall shaggy column, opening out as it ripens and going inky and black later. While young, it is edible, though it would not be pleasant when older. Some of the interesting fungi are in the boletus group. The group as a whole is easy to identify as they have spongy spores underneath rather than gills. It’s harder to tell which is which of the various kinds, and while some are the best eating mushrooms we have, others are poisonous. The best known one is the cep, much used commercially in mushroom soups, and a favourite in restaurants for risottos. Its English name is the penny bun, as it looks like a round brown glazed bun! It lives in coniferous and mixed woods. I have found a near relative of it, the bay bolete, on the wooded ridge going out of Barnt Green towards Blackwell. This is identifiable by the way the spores turn bluish-green when bruised. It is also edible. I have found the smaller birch bolete near Rowney Green. On a “fungi foray” in the Clent hills, we found a lovely slippery Jack, a big bolete with the chestnut-brown slimy top. Though it is edible, the texture is off-putting! On open unimproved grassland at this time of year, you may well find waxcaps. These are small fungi in many different colours, ranging from the blackening waxcap which goes from orange to black, to the yellow-and-green parrot waxcap. They can be very profuse, and look like little jewels among the grass. Another pretty one which you may be able to identify is the amethyst deceiver. I have found them in St Laurence churchyard and on the Barnt Green-Blackwell strip – it grows in all types of woodland. They are small and are bluish-violet all over, and edible. Another blue-violet fungus, about the size of a field mushroom, appears in open parks and gardens. It is the wood blewitt. This comes late in the autumn, often after the first frosts. It’s a very much liked edible species, but related to some poisonous species. The puffball is also very recognisable. It can be small and rounded, white, slightly speckled with brown, or it can be huge and white. The flesh is edible and delicious when young, though when it gets older it is full of rather disgusting spores! I found a big one in the fields below Rowney Green. 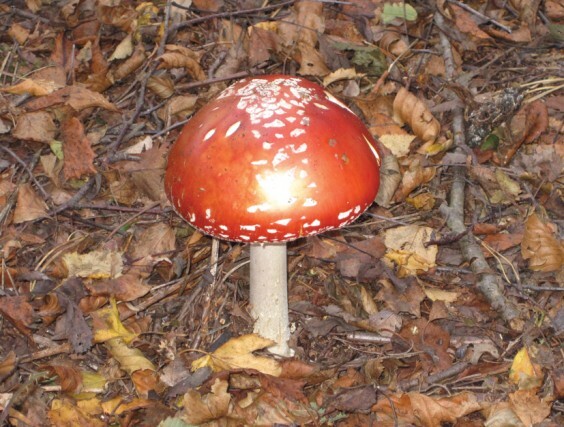 Other easily recognisable ones include the yellow fairy club, small but looking like its name, and the well-known fly agaric or “magic mushroom” (pictured above). This is the familiar red toadstool with white spots. It grows in woodland and is highly poisonous, but beautiful. One place I will be visiting this October is Piper’s Wood, near Hanbury. It is famous for its fungi, especially those that grow on and under beech. I went last year in the dry weather and there was very little, so I am crossing my fingers that there will be some advantage to all the rain we have had this summer! My poem this month is one I wrote when the Withybed Poets chose the theme of the Seven Deadly Sins. To make the wild world into a chaste garden. Can we get ourselves back to wilderness? That she is prey to the sin of gluttony. Animals are better at this, eating what they need. How would we change the world without anger? The real sin is to let anger seep into your fists. No pride in yourself is the fall. Take pride. The real sin is pride without work or effort. Avarice and Envy are more difficult to defend. And the valuing of Stuff we have not produced. Property and theft, both failures, unoriginal sins. Of work for work’s sake, wicked not to. Teenagers in bed till lunchtime, cats sprawled in the sun. Dreaming a canvas as big as a forest? In a job he hates, switching off his brain at the gates? Take delight in the world and its creatures.